How do you know when a packaged amplifier contains a linear voltage regulator if you don't have the schematic? You take it to your curve tracer! In this example we will assume that you amplifier is not a dual-biased part (has V+ and V- terminals) that will be unhappy if it sees the positive supply without the negative one present. The specific example was a crusty 20-year old amplifier from "California Amplifier", model C30622 (we checked, it isn't listed on their web site, and they seem to have morphed into something other than an amplifier company). This unit has a single DC input labeled "+15V", and that is what we are going to look into. Cycle the 370B on/off to clear out whatever settings that last person used. Although the 370B defaults to very benign conditions, you should make a habit out of checking a few things we will describe here; if you have an older CT, you will need to manually set more of the control knobs. You should check to see that the polarity of the collector supply is positive (set to NPN on old curve tracers) and it is in swept mode as opposed to DC or AC modes. You won't be using the step generator, so you don't have to even look at any of its controls. Set vertical/division to 20 mA (this is merely a guess, unless you know apriori how much current the amp will draw). 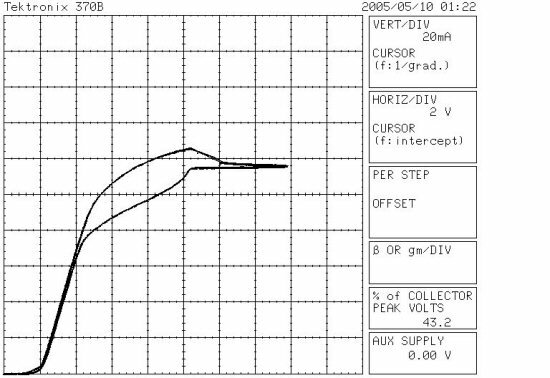 Set collector supply to "emitter open"
What can you tell from the curve? A lot! This amplifier model definitely contains a regulator. You can see where the regulator "cuts in" around 1.5 volts, less than that and it acts like an open circuit (a horizontal line). This "overhead" must be exceeded before the regulator outputs any current, and it is usually quite close to the regulator's minimum drop-out voltage. Around 10.5 volts the current abruptly stops climbing with voltage, this is where the regulator finally starts regulating. If you subtract the overhead of 1.5 volts from the the point where it begins regulation, this is a good indication of the voltage output of the regulator. In this case the amplifier contains a nine-volt regulator. The "looping" is due to a large capacitor on the input, probably n the order of 1 microfarad. This is a good thing, voltage regulators are not usually stable without a microfarad or two on input and output.